When setting a price for your property, the listing level must strike a balance between the seller’s need to achieve the best-possible return and the buyer’s need to get good value. With many years of experience, a professional Realtor can help you set a price that will accomplish both objectives. The market value of your property is determined in exactly the same way as any other commodity – what a buyer is willing to pay for it in today’s market. Despite the price you paid originally, or the value of any improvements you may have made, the value is determined by market forces. Buyers look at about a dozen properties on average before making an offer on a property. As a result, they have a good overview of the market and will compare your property against the competition. If it’s not in line with similar properties that are available, buyers won’t consider it good value for money. 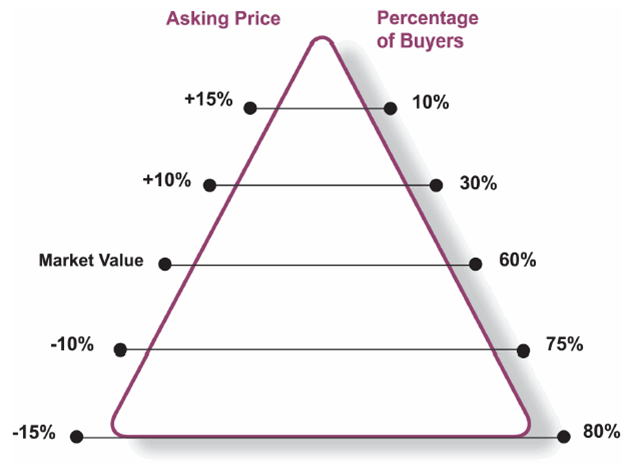 This graph highlights the importance of pricing correctly at market value. The centerline represents market value. As you move above this market value, you attract much smaller percentage of prospective buyers, greatly reducing your chances of a sale. Conversely, as you move below market value, you attract a much larger percentage of potential buyers.